**As of 2/1/19 – All Middle School Classes are at Capacity. Instruction takes place at the outdoor range facilities, in the Golf Academy studio and putting lab, at the on-course teaching hole, on Green Garden’s 45 holes of golf and in the golf dome based on the weather and program curriculum. The Player’s Academy is a developmental program for the experienced middle school golfer, pairing individual instruction with guided practice sessions. Participants receive one hour of individual instruction each month that can be scheduled as either a 1 hour lesson or 2 half hour lesson. They also participate in a weekly one hour group practice session. 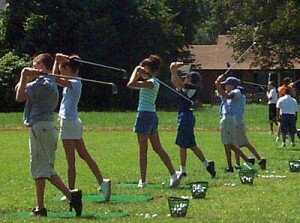 Group guided practice sessions are limited to a maximum of 8 students. At registration, each golfer will choose one class time/day for their practice session. All player’s academy programs require an additional ball purchase. Additional information can be found by clicking the following link – Middle School Players Academy. Registration is ongoing. New students may join the player’s academy at any time during the month, if open spots are available. Click the following link for the registration form – Program Registration. The Middle School Player’s Academy operates 12 months of the year, but does NOT require a 12 month commitment. For pricing, availability, or more information, please contact us at 815-806-7611 or spg.golfacademy@gmail.com. When classes are full, students will be placed on a waiting list. We will try to create a new class if the waiting list grows to 4 students.